As a Pet Parent, are you ready for the unexpected? Accidents do happen. Whether your pet travels with you or stays at home, emergency situations can greatly impact their well-being. If you are involved in an accident at home or while traveling with your pet, you will be separated from them by first responders. When important pet information cannot be communicated due to medical impairment or physical separation, critical pet care may be delayed or suspended. The Wag’N Rover Respond'R® Mobile Emergency Kit is specially designed to help keep an unfortunate situation from becoming a devastating one. 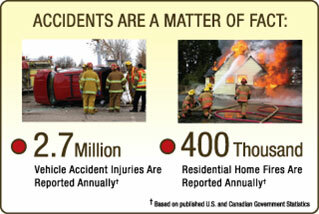 This interactive kit assists you in providing First Responders with important contact and pet information. After filling out the required documentation, simply place the completed kit in your vehicle glovebox and affix the alert decals which tells First Responders about its existence and whereabouts. 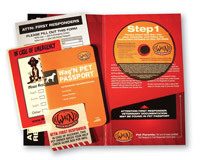 Wag'N Rover Respond'R® v3.0 features additional new forms for Pet Sitters and Pet Boarding facilities. These new forms, as with all forms included in the kit, can be saved on your computer, easily updated and reprinted as needed. They can also be used for an unlimited number of pets. Being prepared for the unexpected is now easier, more convenient and more effective than ever. So get your Wag'N Rover Respond'R® Now!